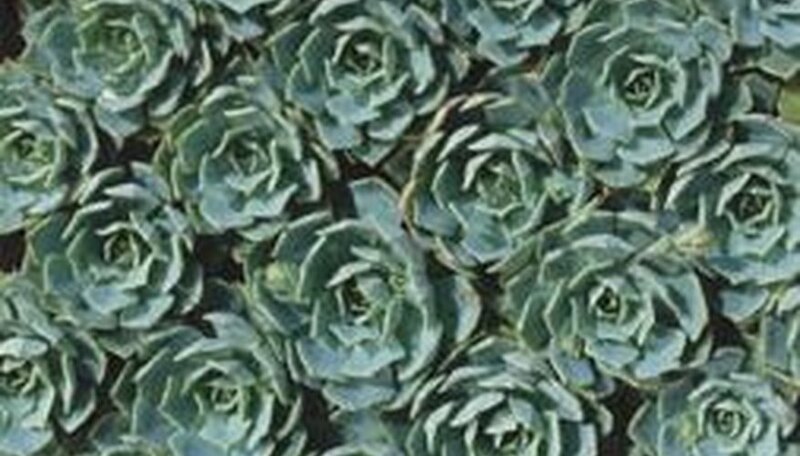 Mexican roses (Echeveria elegans) are also known as Mexican snowballs, Mexican ghost plants and hens and chicks. They grow to be about 12 inches tall and wide. They are considered succulent plants, meaning they have fleshy tissues that store water. Mexican roses have grayish green leaves and pink flowers that bloom in the spring and summer. Mexican roses can be planted outdoors in the spring in USDA hardiness zones 8 to 11. However, they can also be grown indoors or in greenhouses most anywhere. Choose a location that is in full sun or partial shade. If planting indoors, a sunny window sill is the perfect place to grow Mexican roses. South facing windows are best. Prepare your soil. If planting outdoors, your soil needs to be well drained. If necessary, add some sand, humus or compost to the soil. Use general all-purpose potting soil mixed with a bit a sand if you are planting your Mexican roses in containers. The containers should have drainage holes at the bottom. Add a layer of rocks or gravel at the bottom to help improve drainage. Dig a hole that is just as wide, but twice as deep as the current container that the Mexican rose is planted in. Space multiple plants about 12 inches apart. Add a sprinkle of bone meal before planting. Take the plant out of the container and place it in the center of the hole. Backfill the hole with soil and pat it until firm to get rid of any air pockets. Water your plant well and let it dry out until slightly moist between waterings. Try not to get water on the leaves when watering.